Edwards syndrome is a rare chromosomal disorder that occurs when babies have three copies of chromosome 18 instead of two. The severity of the disorder can range from mild to severe and many babies never live beyond their first birthday. 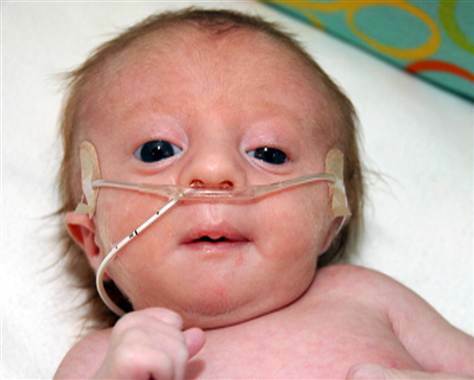 About 1 baby in 3,000-5,000 will be born with Edwards syndrome. In most cases of Edwards syndrome, a child develops 3 copies of each chromosome instead of two. Edwards syndrome is a genetic condition that results in slow growth in utero or low birth weight. Almost 75% of babies with Edwards syndrome, or trisomy 18, are miscarried or stillborn. Babies who survive beyond their first birthday will have developmental disabilities. Although doctors may suspect Edwards syndrome at birth, it cannot be confirmed without genetic testing. What Are the Signs of Edwards Syndrome? A placenta that is too small. Edwards syndrome occurs as a random act during the formation of the sperm and egg. During the division of cells, an error happens and the extra chromosome is either in the egg or the sperm. This disorder is rarely inherited and the chances of parents to have more than one child with Edwards syndrome is unlikely. Three times more females than males have this disorder. The risk of having a baby affected with Edwards syndrome rises as a woman’s age increases. If you, or a close family member, have a baby with Edwards syndrome, your risk increases to have another one. What Are the Types of Edwards Syndrome? Babies with the full form of Edwards syndrome have three copies of chromosome 18 in each cell of their body. About 94% of babies with Edwards syndrome have this type and most will die before infancy. Children born with this type of Edwards syndrome could survive into adulthood, but it is rare. Partial Edwards syndrome means only part of chromosome 18 is copied in the child’s cells. Babies could be only slightly affected or severely. How bad the severity is depends on how much chromosomal material is triplicated. Babies with the extra copy of chromosome 18 in some cells have mosaic Edwards syndrome. This type accounts for about 5 % of the cases. How severely a baby is affected depends on the number of cells that have the extra chromosome. Some babies are severely affected, while others are only mildly. How Is Edwards Syndrome Diagnosed? Routine testing during pregnancy can detect Edwards syndrome. At times, the parents choose to end the pregnancy. Most women have an ultrasound scan around the 20th week of the pregnancy and about 90% of the time, signs that the baby may be affected are noticed at that time. A blood test for Down’s syndrome may also suggest a problem. The results are confirmed by performing an amniocentesis, an invasive test that can show abnormalities with the baby. How Serious Is Edwards Syndrome? Babies with Edwards syndrome typically are miscarried or stillborn. Of those who survive, a third will die within a month because of severe medical problems. About 5 – 10% of babies with Edwards syndrome live past their first birthday and usually have severe developmental disabilities. Surviving to adulthood is rare with trisomy 18. A few individuals have lived until their teen or young adult years, but they need constant care giving and cannot live independently. Can Edwards Syndrome Be Cured? The symptoms of Edwards syndrome can be hard to manage. Parents need help from many professionals and different therapies, such as occupational and physiotherapy, may help the child. No cure exists for Edwards syndrome. Parents need to remember to take care of themselves so they can take the best possible care of their child.